Welcome to the 2018 Powersports Business Power 50 program, recognizing the best powersports dealers in North America. The Power 50, the most elite dealer awards program in the industry, is in its sixth year in 2018, and we'll look forward to celebrating the 2018 Power 50 during AIMExpo in Las Vegas on Thursday, Oct. 11, 2018. 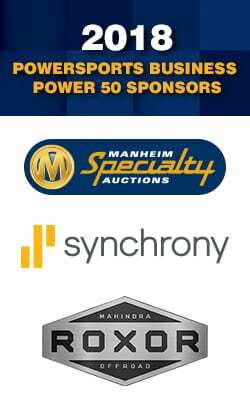 Sponsors of the 2018 Power 50 are Manheim Specialty Auctions, Synchrony Financial and Mahindra Roxor. Look for the 2019 Power 50 online application in January 2019. Due to the Power 50's growth and increasing number of applications, this year individual dealership storefronts will be honored in an effort to help promote the individual store's staff and performance; overall dealership groups will no longer be recognized. The change for 2018 is being made in an effort to honor the dealership principal, general manager and staff that creates an exceptional customer experience at an individual storefront address. To review the online Power 50 application, click here. Managing a powersports dealership to high levels of customer service, sales and, yes, profits, is no easy task, especially in today’s market. Simultaneously creating an atmosphere that exceeds high consumer expectations can be even more difficult. For the most professional of dealerships, however, these tasks have not only become second nature, they are firmly integrated in the business’ day-to-day operations. 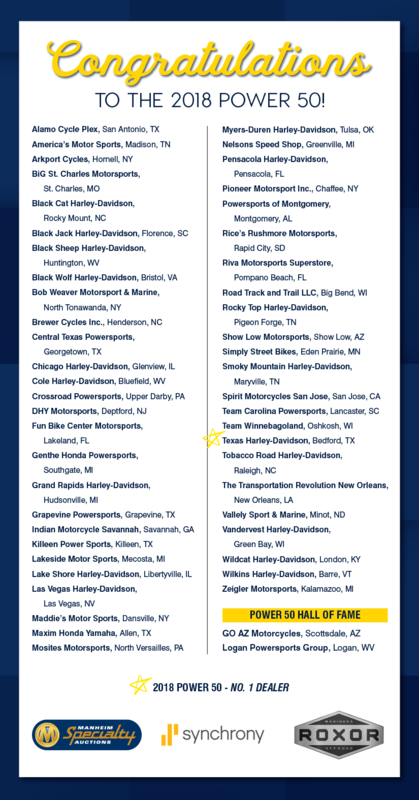 Powersports Business will also select several Best in Class Award winners. Those Best in Class awards may include categories such as Best Customer Service, Best Events, Best Service Department, Best Place to Work, Best Digital Strategy, Best Marketing, Best Industry Advocate, Most Innovative, or the Ray Price Community Service Award. We may change or add to those categories as we review the applications. The application is meant to provide us with the information that is crucial to evaluation. Any additional photos you would like to submit with your application can be delivered either through a file transfer site of your choice to dmcmahon@powersportsbusiness.com or mailed on CD or flash drive to Powersports Business Power 50, 10405 Sixth Ave. N, Suite 210, Minneapolis, MN 55441. We once again will be celebrating the 2019 Power 50 dealers at an awards dinner during AIMExpo in Columbus, Ohio. If you have any questions about the 2018 application, sponsoring the Power 50 or the program in general, please contact editor in chief Dave McMahon at dmcmahon@powersportsbusiness.com or (763) 383-4411.